Get a rare track free! 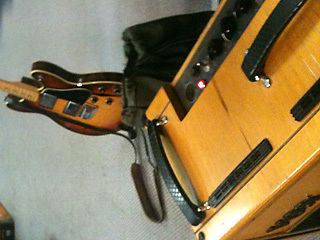 On the second anniversary - to the day - of starting this blog, Splurge were in the studio recording our fourth album. With James Black producing and Robin Mai engineering at Sing Sing we are in good hands. As 2013 hurried away, we just ran out of time to get everyone in the same room. 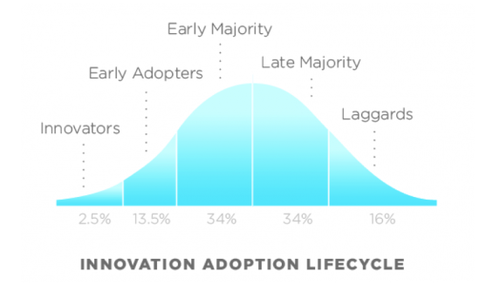 While Greg ran with our crowdfunding campaign (we didn’t get there) and applied for project funding (we don’t know yet), windows opened and closed. Plans were made and re-made and - just like the man said in the quote that set the tone for this escapade http://splurgeband.tumblr.com/post/22963662639/concerning-all-acts-of-initiative-and-creation - providence favours the bold! 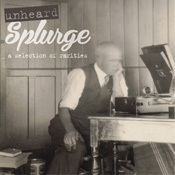 The download of Splurge Unheard, a selection of rarities spanning 1997-2007, released to celebrate our 15th anniversary, now includes the home demo of Song of Love. The selection includes new mixes of three never-before-heard tracks - one from each Splurge album - plus and six other unreleased and rare recordings. Buy now for $8 and get immediate download of the 10-track album in the high-quality format of your choice, plus unlimited mobile access using the free Bandcamp listening app. Package includes booklets, inserts and cover art for each Splurge album, as well as the bonus track. Splurge’s crowdfunding project was in the news! But, alas, it’s too late now to pledge. Simply, the numbers just didn’t add up. Thanks, folks, for looking, but I’m reliably informed that to build momentum you need to get more people onto the dancefloor early to make everyone else feel less awkward. Story of my life. Unheard Splurge #5 - I Need Your Love by Splurge. The Two Gregs do their best John and Paul impersonations (which is which?) on this song recorded for Splurge’s debut album but omitted from the final track listing. The song pre-dates Splurge. Greg Williams’ acoustic version was released on vinyl-only “Here and Now” (1990)—a collection of home demos on Greasy Pop records—and re-issued on vinyl and CD with “Louder Than Words” (1991), by The Greasy Record Company. Unheard Splurge #4 - Song of Love by Splurge. Happy all the time! This song is a co-write with Steve Housden of LRB (don’t ask). It was recorded for the first Splurge album but omitted from the final track listing. Just too much love, I guess… but the Two Gregs later added it to their set as The Every Brothers in an unrecorded Dragon-inspired, scarf-waving piano version. Unheard Splurge #3 - Kiss Me by Splurge. Unreleased track from “The Cure For The Cure”. This recording wasn’t completed for the album - was a bit of an ugly duckling. Greg Williams has added a new vocal, with Leticia Maher singing backing vocals. The rest was already there, but buried: Neville Hill plays bass and jangles on 12-string, Owen Smythe comes in late and kicks it along, and James Black chimes in with the ‘brown’ guitar and synth flourishes. Ta da! Unheard Splurge #2 - Under Your Thumb by Splurge. Unreleased track from the album “Heavy Weather” (2002) by Splurge. This recording by David McCluney at Atlantis was recoverd from the original ADATs as a complete take but with only a guide vocal. Greg Williams and Greg Arnold finished the vocals, then added some acoustic 12-string and wig-out! Unheard Splurge #1 - Something About Love by Splurge. Unreleased track from the album “Splurge” (1999) by Splurge. This recording was made in the first sessions for our debut album. It was completed but not considered for the final track selection. “What were we thinking?” said Greg Arnold when I extracted this from the ADATs. Cabin Flashback #7 - I Don’t Feel It by Splurge. Yes, we do have songs shorter than five minutes. But no, they aren’t as much fun to play as this one. This song has a strong connection to The Cabin voodoo. Greg Williams wrote it on the couch just behind the door and we came back to lay the guitars on thick and heavy! 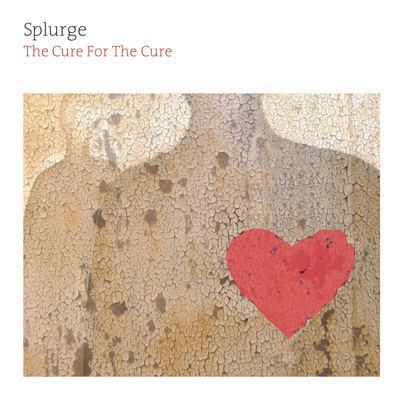 Cabin Flashbacks #6 - The Cure For The Cure by Spurge. 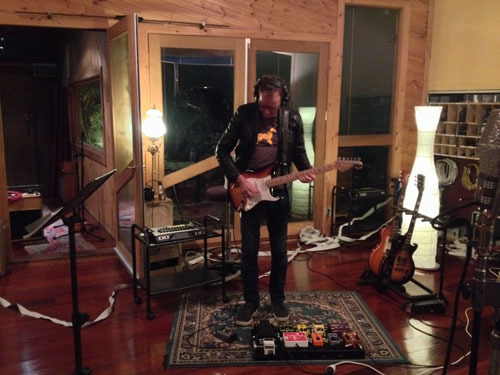 In 2003 and 2004, Cure sessions moved to The Cabin, with producer James Black, Neville Hill and Greg Williams (Owen Smythe recorded his drums and left for the UK). Neville played guitar for days while Greg made the tea and James explored the ‘mindless’ possibilities. What other albums end with the title track? This will be a solo Splurge Acoustic show by Greg Williams, showcasing new songs the band has been recording over the past few months, plus some new material. This is Greg’s first solo gig since supporting The Motels and Steve Nieve back in 2014 and the set will showcase songs from the forthcoming Splurge album. 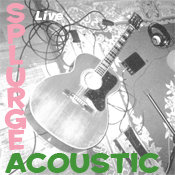 This is the first Splurge Acoustic show as a three piece, following the duo version’s debut earlier this year. 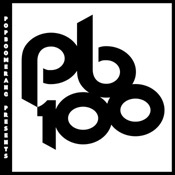 1 April 2015 | PB:100—Poopboomerang’s 100th release—is a compilation of 32 newly-commissioned recordings and unreleased songs, including the Splurge Unheard rarity Kiss Me. This is Greg’s first solo gig since supporting The Motels and Steve Nieve last year. 28 November 2013 | NEW BONUS TRACK ADDED The download of Splurge Unheard, a selection of rarities spanning 1997-2007, released to celebrate our 15th anniversary, now includes the home demo of Song of Love. The selection includes new mixes of three never-before-heard tracks - one from each Splurge album - plus and six other unreleased and rare recordings. BUY NOW FOR $8 and get immediate download of the 10-track album in the high-quality format of your choice, plus unlimited mobile access using the free Bandcamp listening app. Package also includes booklets, inserts and cover art for each Splurge album. 15 November 2013 | ALWAYS WINDOW SHOPPING, NEVER STOPPING TO BUY... 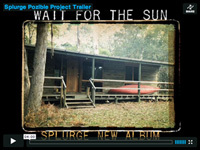 Thanks to everyone who has visited our crowdfunding project so far - www.pozible.com/splurgewaitforthesun/ But with only 15 days to go we need to get a lot more of you a’ pledging... What's a’ holding you back? 26 September 2013 | That is the name of our crowdfunding project - and we mean it! Live Music - Greg Williams will be playing a half hour acoustic set and discussing crowdfunding on Hashtag - #onsyn from 2:00pm this Sunday (27 October). 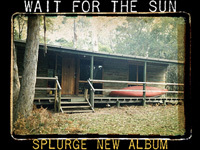 16 October 2013 | Splurge has today launched Splurge Unheard—a selection of rarities—exclusively via the band's new Pozible project to record and mix our new album Wait For The Sun. Supporter rewards include CD and Download packs, acoustic videos by request, songwriting workshops, a record production deal, a preview listening party, as well as private acoustic and full band shows. 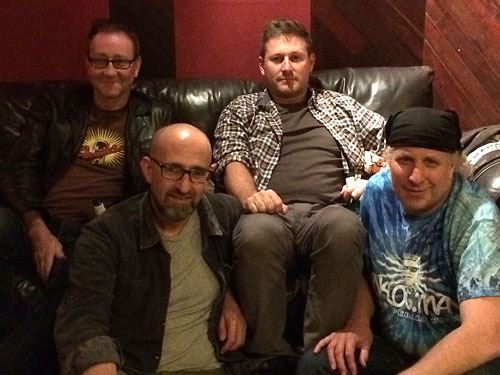 20 September 2013 | Greg Williams and Greg Arnold put down their electric instruments to present an acoustic set of old, new and rare Splurge songs as opening act for Australian pop icons Mental As Anything at the Flying Saucer Club on Friday 6 December at 8:40pm. 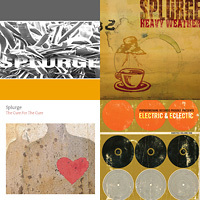 10 September 2013 | This week, we will be streaming new mixes of three never-before-heard tracks—one from each Splurge album—that for one reason or another were not completed at the time. These and six other unreleased and rare recordings will be included on an exclusive fans-only album, to be launched later this month. Get The Cure For Free!